SDO sees 'Dark Fireworks' on the Sun | Watts Up With That? From Science@ NASA: On June 7, 2011, Earth-orbiting satellites detected a flash of X-rays coming from the western edge of the solar disk. Registering only “M” (for medium) on the Richter scale of solar flares, the blast at first appeared to be a run-of-the-mill eruption–that is, until researchers looked at the movies. The plasma blobs were as big as planets, many larger than Earth. They rose and fell ballistically, moving under the influence of the sun’s gravity like balls tossed in the air, exploding “like bombs” when they hit the stellar surface. Some blobs, however, were more like guided missiles. “In the movies we can see material ‘grabbed’ by magnetic fields and funneled toward sunspot groups hundreds of thousands of kilometers away,” notes Young. Long-range action has become a key theme of solar physics since SDO was launched in 2010. The observatory frequently sees explosions in one part of the sun affecting other parts. Sometimes one explosion will trigger another … and another … with a domino sequence of flares going off all around the star. “The June 7th blast didn’t seem to trigger any big secondary explosions, but it was certainly felt far and wide,” says Young. If Young is right, more dark fireworks could be in the offing. Stay tuned. What a grotesque mis-interpretation of the intent of Young’s remark. He’s commenting that it represents a potentially important NEW finding. You seem to be making a point Leif. Something I don’t believe Anthony was trying to do. So this seething bubbling lump is what we rely on to heat our little planet? Looks mighty unstable to me. LOL Way to burst my bubble, Leif. Here I was thinking how cool this was and you come along and point out that its nothing new. Oh well, I guess its all been done after all. Yep….”half of the sun blowing itself to bits…” Just spent all night replacing two spindle bearings on my lawn mower, and now *this*. Sometimes each new generation has to rediscover old truths. Generally, beware of press releases gushing that something is ‘never before seen’. Sometimes each new generation has to rediscover old truths. A moment before I read your comment, Leif, I was actually re-inventing the stump-jump plow. Just for my own interest. mind you, and to reinforce my admiration for the frustrated plowman who did. 100% Right! These press releases of ordinary solar events are getting annoying and more frequent. That maybe because, literally, these images have never before been seen ! Previous images were random snapshots compared to these. 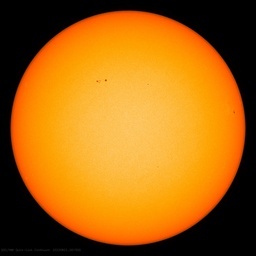 Although it’s nothing new to the Sun, SDO is giving us glimpses of its activity that have never been seen in such detail before. It hasn’t been ever seen like that before, in full detail and glory. Truly magnificent and terrifying. It seems that Dr. Svalgaard not only lacks any sense of humor (as proven by his previous posts) but any sense of wonder as well. What a killjoy. I think I understand Leif’s comment, based on a comment from someone else about single snapshots. In the “Old Days”, people sat and watched the Sun in real time using telescopes. So, yes, things like this have been seen before, just not on digital images for instant playback. The Solar Dynamics Observatory AIA imager (observing in extreme ultraviolet light) actually spotted a sun-grazing comet as it disintegrated over about a 15-minute period on July 6, something never observed before. The angle of the comet’s orbit brought it across the front half of the sun. Given the intense heat and radiation, the comet simply evaporated away. The comet was probably a member of the Kreutz sun-grazer family. So modern day observations, rather than computer modeling, are useful after all, albeit repeated. I think this is a problem in the modern, instant, video clip world we live in. How many millions of mobile devices with cameras and internet connections are in use capturing “weather events” instantly spat out across YouTube and the MSM? I’m not a big fan of the electric universe, but after the ejections rained back on the surface, the shock waves from lots of them sure looked like lightning . The problem with press releases is that they have to be written up to be interesting to a larger crowd, so you get remarks like this one and more sober remarks are left out because they’re boring. Adding the “… in the very few years that we’ve been observing such things…” is boring. A couple of years ago I came face-to-face with a Cinnamon Colored (Black) Bear. With a Nikon D40X, I took several digital color random snapshots. A high quality movie would have been interesting – still the likely result if a camera purchase were made today. 50 years ago the encounter might have yielded a single black/white photo. 150 years ago there would have been a verbal report. Beware of but rejoice in better reporting. Leif, I was actually re-inventing the stump-jump plow. Not previously seen or visible through telescopes; note the placidity of the visible spectrum photo. Only evident in particular wavelengths. So this particular scope of the phenomenon has NOT been known and previously observed. While the Sun may do it every month or twenty, its power and pattern is new to science. Notwithstanding the need of certain scientific poseurs to persistently assert omniscience, personally and on behalf of the Consensus. Clearly, these are death eaters apparating on the Sun, looking for Harry Potter! Generally, beware of press releases gushing that something is ‘never before seen’. The problem, I believe, is not so much in saying “never before seen” – especially when the statement is factually correct – as it is in the all-too-common interpretation of those words to mean never before happened. For some reason, far too many are unable to make the distinction. It’s obvious. It’s not plasma at all – it’s the sun’s ejected iron core following the magnetic force lines back to the surface. Don’t you all realise? The sun’s mighty angry at all your CO2 emissions that have reached all the way to the sun!!! “killjoy” counts as foul mouthed? I must be a sailor or something. Regardless of some people thinking this is a nothing event I for one find it fascinating. Just thinking about the grand scale of this puts me in awe. Many of those chunks are larger than planets. That’s wild IMHO. The SDO pictures are indeed spectacular. The foulness is in commenting on persons rather than on science. I don’t what the dark stuff is, but it is clearly a harbinger of doom.